About five years ago, I approached our wonderful La Vergne Public Library director about promoting the idea and/or sponsoring the “Little Free Library” movement in our city. The funding just was not there nor was there a groundswell of support for the idea (although it remains a great idea!). 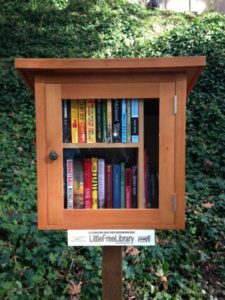 Today one of our readers posted a query on our Facebook page about whether there are limitations in the municipal code regarding setting up a Little Free Library in a neighborhood. (Thank you for asking, Loraine Flegal!) I can’t imagine there would be any limitations to setting one up, but I referred Ms. Flegal to our Planning and Codes departments to ask. I hope she follows up and gives us the answer. While we hope books aren’t really scarce in our area, you just never know what it’s like inside someone’s home. Also I think that there could be some irresponsible (mean!) actions that people who offer a Little Free Library, but you can’t let possible vandals or bad behavior keep you from doing something good. (This was the same thing I argued when I was advocating for a playground at Lake Forest Park). My point – don’t be discouraged if you hit bumps in the road if you go this route. I would love to see Little Free Libraries all over our subdivisions!! 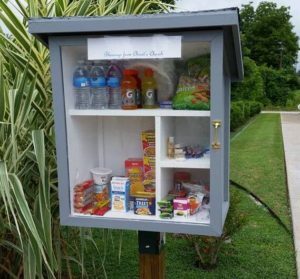 The Little Free Pantry is a grassroots, crowd-sourced solution to immediate and local need. Whether a need for food or a need to give, the Little Free Pantry facilitates neighbors helping neighbors, building community. So how about it, La Vergne? Is this something worth pursuing? "Fresh Ideas: Little Free Library", 5 out of 5 based on 1 ratings.